Below is Part III of a report from the Walla Walla Valley including wines from Cayuse Vineyards, Gramercy Cellars, Abeja, Reynvaan Family Vineyards, and Corliss Estates. Read Part I here and Part II here. Though Cayuse Vineyards has been more successful than most wineries in the Pacific Northwest or even around the world, vigneron Christophe Baron is far from finished putting his imprint on the industry. There are always new projects afoot, new frontiers being explored. “We are not trying to reinvent the wheel but are trying to save some knowledge,” Baron says. Indeed, up until 1956, all of the Baron family vineyards in France were farmed by horsepower, with Baron’s grandfather the first to buy a tractor. “I always knew that I would have some draft horses out of respect for him,” Baron says. Another project – one that has finally reached fruition – is No Girls. The seeds of this winery were planted ten years ago when Baron was looking for a general manager and asked friend Trevor Dorland to join him. At the time, Dorland liked the idea of having a shared label, something that they would have in common. The vines for the No Girls wines were planted in 2003, 2004, and 2005. The first vintage was made and discarded. “We won’t put something into the bottle until we really, really like it,” Baron says. The winery gets its name from a building, which was formerly a bordello, that Baron purchased in 2002. 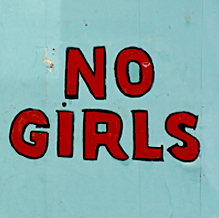 When the bordello was closed down, the words “NO GIRLS” were painted on the walls just past the main entrance. The image now adorns the label. “It took about ten years for this project to come together,” Baron says of No Girls. “That’s why we call this vineyard La Paciencia.” He also notes that the vineyard site ripens slightly later and at lower Brix than the others he farms. Production at No Girls is 500 cases. Another one of the notable aspects of my visit – which took place prior to harvest – was the contrast between Baron and many other winemakers I spoke with in the state around that time. While many were noticeably more relaxed during the 2012 growing season after two successive cool years, Baron was one of the few who seemed to have the same level of concern that he did in the previous two vintages. Many of these wines play in the upper register of the rating scale. To provide some differentiation, the Wallah Wallah Grenache Number Two – one of two reserve wines the winery has made in its history – is as fine a wine as I have ever had. Other high highlights include the 2009 Cailloux and En Chamberlain Syrahs. Overall though, it’s hard to imagine tasting through a more compelling lineup of wines, and the latest releases will not leave any of the winery’s fans disappointed. (Excellent/Exceptional) Fairly dark in color for Grenache, this is an aromatic wine full of mineral, earthy funk, truffle, and floral notes. The palate is soft and perfumed, on the lighter side of medium bodied, like liquid rocks, teeming with intensity and a tannin profile more prominent than is frequently seen in this variety. 163 cases produced. (Exceptional) Dark in color. An aromatic wine with ash, floral notes, roasted meat, and abundant minerality. The palate is perfumed and soft with an incredible sense of vibrancy and purity and more fruit flavors than often on display in its sister winery. 162 cases produced. (Excellent) Pale copper colored. An aromatically compelling wine with a vibrant minerality, light strawberry, and floral notes. The palate is medium bodied, textured with bracing minerality and an extended finish. 100% Grenache. 110 cases produced. (Exceptional) Dark in color. A brooding wine, loaded with mineral, ash, iodine, and savory notes. The palate is perfumed, ethereal, with incredible intensity and a distinctive umami quality leading to an exceptionally long finish. Aged in neutral puncheons. 100% Grenache. 14.3% alcohol. 491 cases produced. (Exceptional) This is nothing short of a scale busting wine – as good a wine as I have ever had. It has incredible aromatic complexity with a distinct ash component along with peat, and dried tobacco. The palate is outrageously perfumed with abundant savory flavors and minerality that covers the palate in waves of intensity. Note that this wine is not yet released and may be released under its own label, not that of Cayuse. 181 magnums produced. (Exceptional) Dark in color. The oak is a bit more prominent here aromatically than is often seen from the winery along with floral notes, cherry, tobacco leaf, spice box, and a pleasing herbal note. The palate is soft and velvety with more overt fruit flavors than often seen from Cayuse and tremendous purity. 60% Cabernet Franc, 40% Merlot. 163 cases produced. (Excellent/Exceptional) Dark in color with abundant floral notes, spice, cassis, and mineral notes layered over cherries. The palate is soft with cherry and a saline quality backed by chalky tannins. 80% Cabernet Sauvignon, 20% Merlot. 307 cases produced. (Exceptional) Dark in color. An expressive wine with a light minerality, earth, peat, cassis, and raw meat. Incredible inner mouth perfume, coating the palate with intensity but without great weight accented by winding cherry flavors. A compelling Cabernet Sauvignon that couldn’t come from anywhere else in the world. 100% Cabernet Sauvignon. 14.6% alcohol. 188 cases produced. (Exceptional) Dark in color. This wine pops aromatically with orange peel, floral notes, roasted meat, umami, and mineral notes. The palate is soft and perfumed with incredible intensity and length and fine grained tannins. 100% Syrah. 14.8% alcohol. 754 cases produced. (Exceptional) Dark in color. A moderately wine with iodine, roasted meat, ash, mineral. The palate is on the lighter side of medium bodied, shimmering with intensity. 100% Syrah. 362 cases produced. (Exceptional) Dark in color. Arresting aromas of bloody beef, mushroom, and savory notes. Coats the palate from end to end with soft, savory flavors with incredible intensity and length. Among the best from the 2009 vintage. 100% Syrah. 314 cases produced. (Exceptional) Less overtly funky than some of the other 2009 vintage releases, the Bionic Frog is full of peat, mineral, dark plum, spice, and light floral notes. The palate is perfumed with savory flavors and a seamless feel with incredible length. 100% Syrah. 437 cases produced. (Exceptional) An aromatic wine with black olive juice, mineral, savory notes, and a light earthy funk. The palate is incredibly soft, more feminine in style than the other 2009 vintage offerings, with great minerality and exceptional length. Wound up tightly at present. Give one to two years or decant. 100% Syrah. 14.7% alcohol. 493 cases produced. (Excellent) An aromatically intriguing wine with tobacco leaf, mineral, cherry, and exotic spices. The palate is soft with a layer of tannins underneath the fruit. 100% Tempranillo. 210 cases produced. 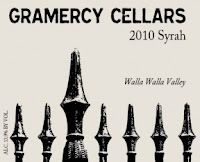 The latest releases from Gramercy Cellars – all 2010 vintage wines with the exception of the thrilling 2009 Cabernet Sauvignon – again find the winery in top form. The freshness and intensity of the 2010 vintage is on full display, and in no case more so than the Walla Walla Valley Syrah. Each year the winery seems to raise the bar higher and higher with this wine, and the latest release is no exception. The 2010 Walla Walla Valley Syrah is quite simply one of the best wines Gramercy Cellars has ever made. A full ninety-five percent of the fruit comes from Les Collines Vineyard with a splash from newcomer SJR. The price has gone up here but so has the quality. Another standout comes from the winery’s club wines – the 2010 Olsen Vineyard Grenache. Winemaker Greg Harrington writes of Grenache, “Washington is the second best place in the world for Grenache. Quote me on that.” Bottles like this make the argument for him. (Excellent) A moderately aromatic wine with abundant mineral notes, smoked meat, and white pepper. The palate is on the lighter side of medium bodied with a perfumed, textured feel. Will only improve with some additional time in the bottle. 80% Syrah, 12% Mourvèdre, 4% Grenache, and 4% Cinsault. Olsen, SJR, and Alder Ridge vineyards. 14.2% alcohol. 393 cases produced. (Exceptional) A perfumed, mineral laden wine with sea breeze, sliced black olives, violets, and roasted meat. The palate is arresting, showing exceptional texture and refinement, loaded with smoked meat flavors and silky tannins. Pushing the upper register of the rating scale, this wine is a perfect window into what the 2010 vintage can hold in the right hands. Better yet, it will only get better with five to ten years in the cellar. 100% Syrah. Les Collines (95%) and SJR vineyards. Approximately 40% whole cluster. Aged in neutral oak. 13.9% alcohol. 595 cases produced. Sample provided by winery. (Excellent) A Grenache-dominant wine, the 2010 The Third Man is locked up tightly right now with high toned raspberries, white pepper, and spice. The palate boasts incredibly pure, fresh fruit flavors with a soft, textured feel. 80% Grenache, 15% Mourvèdre, 5% Syrah. Alder Ridge and Olsen vineyards. 14.7% alcohol. 341 cases produced. (Exceptional) Part of the wine club lineup, this wine is 100% Grenache hailing from Olsen Vineyard. It is an aromatic wine with abundant white pepper, brown stem notes, incredibly pure raspberry aromas, and a light meatiness. The palate is broad and expansive with incredible vibrancy and freshness. A standout. 100% Grenache. Aged in neutral oak. 13.7% alcohol. 85 cases produced. Sample provided by winery. (Excellent/Exceptional) A moderately aromatic wine with high toned aromas of spice, white pepper, and raspberries. The palate is full bodied and plush with soft tannins and cherry flavors. 100% Mourvèdre. Alder Ridge and Olsen vineyards. 122 cases produced. (Exceptional) Aromatically generous with high toned herbal notes, floral notes, and restrained cherry aromas. The palate is ripe and full of incredibly persistent cherry flavors that linger on the finish. A superb, standout Cabernet Sauvignon. 77% Cabernet Sauvignon, 14% Cabernet Franc, 9% Merlot. Phinny Hill, Portteus, Estate, Pepper Bridge, and Octave vineyards. Aged in French oak (40% new). 14.2% alcohol. 540 cases produced. The current releases from Abeja bring some fascinating wrinkles. Among them is the continuing emergence from the winery’s estate sites. One such example comes from the 2011 Mill Creek Vineyard Chardonnay – the winery’s first. “There was enough of a ‘wow’ factor that I wanted to do it,” winemaker John Abbott says of the wine. Indeed there is, but the strength of the estate vineyards is on display throughout the latest releases, including the winery’s stunning 2010 Walla Walla Valley Syrah. Abeja’s trademark, however, continues to be its Cabernet Sauvignons and with good reason. The Reserve Cabernet Sauvignon – only made in special years – is, again, deserving of its reserve status. (Good/Excellent) An aromatic wine with lime zest, crushed flowers, Creamsicle, and light wood spices. The palate is broad with light, delicate citrus and flower petal flavors. 14.2% alcohol. Sample provided by winery. (Excellent) An aromatic wine with roasty toasty spices and red fruit. The palate is on the lighter side of medium bodied with an elegant styling and abundant oak spices. 100% Merlot. Sagemoor, Bacchus, Dionysus, and Heather Hill vineyards. Aged 15 months in French (90%), Hungarian, and American oak (40% new). (Excellent) A gorgeous expression of Cabernet with coffee, blackberry, cherry, spice, and herbal tones. The palate if filled with chocolate and cherry flavors backed by well integrated tannins. 96% Cabernet Sauvignon and 4% Merlot. Heather Hill, Bacchus, Dionysus, Weinbau, Hedges Estate, Red Mountain vineyards. Aged 23 months in French oak (60% new). 14.8% alcohol. Sample provided by winery. (Good/Excellent) An aromatic wine with herbal notes, pepper, cherries, and spice. The palate is softly structured with cherry flavors, abundant herbal notes, and cranberry-like acidity. 100% Cabernet Sauvignon. Block 4 and Block 5. (Exceptional) Medium ruby. Draws you into the glass with layers of complexity, including cherry, cassis, dry chocolate, spice box, and light herbal notes. The palate is supple and lush, full of chewy cherry flavors that draw out across the palate. 100% Cabernet Sauvignon. 100% Bacchus Block 3 (1972 planting). Aged 28 months in French oak (100% new). 165 cases produced. (Exceptional) An aromatic wine chock full of fruit ranging from blackberry to red currant along with game and mineral notes. The palate is incredibly soft, silky, and textured with lithe tannins and puckering, spritely acidity that draws the flavors along to a pronounced finish. An incredibly pretty, finesse driven wine that should provide a decade or more of drinking pleasure. 100% Syrah. Mill Creek Vineyard. 13.9% alcohol. 214 cases produced. Sample provided by winery. 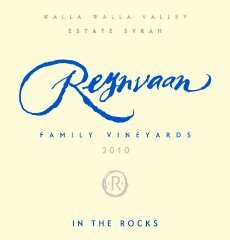 In a very short time, Reynvaan Family Vineyards has vaulted into the upper echelon of Northwest wineries. This success is reflected in the recent closing of the winery’s mailing list and the move to an allocation system for its wines. For people who have been following the winery, none of this should come as a surprise. The current releases from Reynvaan include the winery’s first from its Foothills in the Sun Vineyard. Located adjacent to the winery facility, this vineyard sits – as the name would suggest – in the foothills of the Blue Mountains and is one of the higher elevation sites in the area. The 2010 Foothills Reserve is stylistically distinct from its Rocks region counterparts with less earthy funk and more black pepper. It will be fascinating to see how the site evolves in the coming years. True to the vintage, the 2010 wines from Reynvaan are less opulent and expansive on the palate than previous releases. However, the quality remains high and these wines will age beautifully in the cellar in the years to come. All wines sampled at 60 degrees. (Good) An aromatic wine redolent with floral notes and peaches. The palate is medium bodied with abundant stone fruit flavors. 70% Viognier, 30% Marsanne. (Excellent) An aromatic wine full of black pepper, savory notes, mineral, earth, orange peel, and light floral notes. The palate is leaner in style than the winery’s Rocks offerings from this vintage with abundant savory notes and grainy tannins. A very fresh, pure wine. (Exceptional) A brooding wine with light floral notes, Calamata olives, and orange peel. The palate is incredibly perfumed, full of savory flavors with a textured feel. Less opulence than previous vintages but all of the intensity. (Exceptional) Aromatically subdued with mineral, earthy funk, black olives, and savory notes. The palate is restrained but still perfumed with more noticeable tannins than previous vintages. Syrah co-fermented with Viognier. (Exceptional) An aromatically restrained wine with black pepper, earthy funk, and mineral notes. As it opens up, aromas of black olive come to the fore. While more restrained than previous vintages, the palate retains the sense of volume that has always been the hallmark of this wine. Syrah co-fermented with Marsanne. (Exceptional) This aptly named wine is like drinking liquid rock with incredible minerality and a light earthy funk. The palate has great lightness and purity with abundant savory flavors with more prominent tannins than in recent vintages. 100% Syrah. It is hard to understate just how much Corliss Estates is on its own trajectory as a winery. However, one simple fact sums it up nicely. 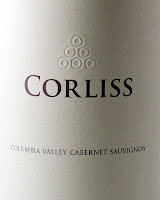 While many Washington wineries are releasing their 2010 – and even 2011 – red wines, Corliss’ current vintage is 2007, a full three to four years apart from most of the state’s wineries. Why? While for some wineries being this far back on vintages would be a sign of stagnation and flagging sales, for Corliss it is a sign of their patience. Each bottle receives at least 30 months in barrel and additional time in the bottle before release. For the current releases, this provides a unique look back at the stellar 2007 vintage – with the Cabernet Sauvignon among the best wines the winery has made to date. Owners Michael and Lauri Corliss have interesting projects afoot. Corliss’ sister winery Tranche Cellars continues to spread its wings (more on this in a subsequent post). More wineries continue to pop up using fruit from the Corliss’ Red Mountain Estate Vineyard. Additionally, Corliss purchased the Blackwood Canyon vineyard earlier this year, giving him a considerable amount of acreage on Red Mountain. Stay tuned. (Excellent) An aromatically appealing wine with vanilla bean, ground coffee, dark fruit, a light gamey note, and barrel spices. The palate is very soft, full of dark fruit flavors, abundant barrel accents, and beautifully integrated tannins with a finish that continues on and on. Stillwater Creek Vineyard. Aged 30 months in French oak (65% new). 15.4% alcohol. 313 cases produced. Sample provided by winery. (Excellent/Exceptional) An aromatic wine with cocoa, floral notes, and red and black fruit. The palate is rich and luscious with layers of complexity. Cabernet Sauvignon, Merlot, Cabernet Franc, Petit Verdot, and Malbec. Aged 33 months in French oak (75% new). 15.3% alcohol. 575 cases produced. (Exceptional) An aromatic wine with coffee grounds, black cherry, floral notes, and spice. The palate is bold and rich, a multiple swallow wine full of dark fruit flavors and firm tannins. Bacchus, Dionysus, Stillwater Creek, and Red Mountain vineyards. Aged 33 months in French oak (75% new). 15.3% alcohol. 915 cases produced. So what was your take-away from this trip, Sean? Duane, I'd say one of the big take homes for me is what a great vintage 2010 looks to be for the Rhone varieties. Some pretty special wines made. Are you thinking of the 2005 Cayuse Syrah Neutral Barrel Cailloux Vineyard as the other reserve wine? Just a quick clarification. Since the Cayuse God Only Knows and Armada are held back an extra year - are those respective wines listed above actually 2008? Sean, I completely agree on the Gramercy wines. Excellent-Exceptional-Amazing. Greg Harrington certainly backed up his Grenache comment big time with the Olsen bottling. What a great tasting I had back in September! Also, I have to say that the Wallah Wallah Number 2 sounds like the astounding Washington Grenache I've been waiting for.